As a guest of ours you’ll be signed in as a member of the Gästis Book Club, whether you like it or not! That means you’re welcome to read whatever you like out of the 15,000 books available at the hotel and you are also free to take your favourite book home with you. In the corridors, in every hotel room, in the conference rooms, in the toilets and even in the Lenin Spa – at Hotel Gästis there are books everywhere! Large books, small books, flimsy books and chunky tomes. The books are a significant interior design feature (or more like a interior foundation) at Gästis, but most of all they are there to be read, perused and browsed. The quantity of books at Gästis is continually increasing: Locals often come past and donate boxes of books that they have inherited and that they don’t have the space for at home, and charity shops give us their surplus too. Many guests leave a bagful or two behind. Many old heirlooms have been saved in this way from ending up at the local refuse dump. Maybe Hotel Gästis is the Varberg equivalent to The Cemetery of Forgotten Books in Barcelona, which is described in the novels by Carlos Ruiz Zafón? All guests automatically become members of the Gästis Book club and may not only peruse and browse all the books, but they are also allowed to take home a favourite book of their choice. Anyone who can’t decide on a single book, but want take two or three or twenty home, is charged SEK/book. Thefts do happen at the hotel, but this sort of crime is no reason to get upset or agitated according to Lasse Diding. As long as they end up at a home of a book lover, then that’s all right, he says. 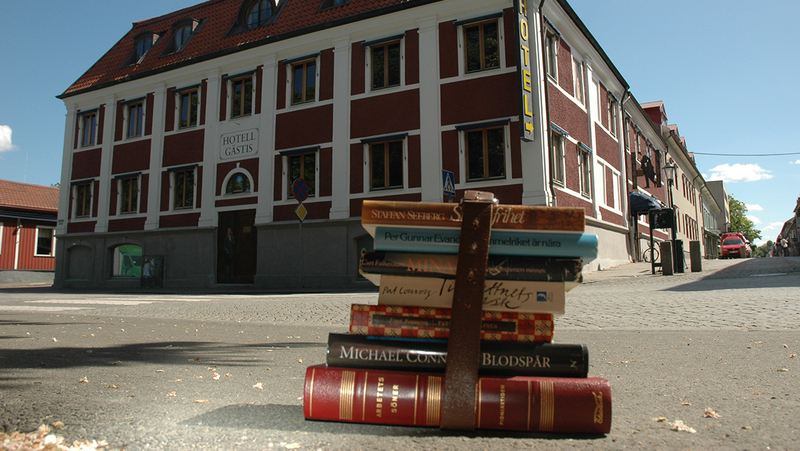 The abundance of books has made Hotel Gästis very popular with authors and bookworms alike. An avid guest was for instance Jan Myrdal, the author, who has also become the eternal guest through the tromp l’oeil painting portraying him on the facade facing Västra Vallgatan. Jan Myrdal is nowadays living at one of Lasse Diding’s houses and therefore doesn’t have much of a reason to spend the night at a hotel in Varberg. The author is however still surrounded by books. In the same house as his current residence, the Jan Myrdal library has now been put together – a collection of approx. 50,000 volumes that Myrdal has built through his lifelong, continuous book collecting in all the various topics and areas that the authorship required him to. Click here if you want to know more about the awards and the heated debate about these!